Camp NaNoWriMo has begun, and I am so excited!! I’ve packed my backpack, my hiking gear, and my s’more supplies, so I am ready to set off. Of course, Camp NaNoWriMo isn’t really an outdoor camping adventure. Rather, it’s a month of writing as much as possible- ideally to reach the goal of 50,000 words. Camp NaNoWriMo (National Novel Writing Month, which is normally in November) has shined on July once more this year. Writers from around the country (and even the globe!) are gearing up with their pens and keyboards to create some seriously fantastic stories, poems, plays, anything! It officially began yesterday, but it’s definitely not too late to join in on the fun! My decision to participate in this event this year was sparked by two distinct reasons: 1) this is my last summer of doing nothing before college, so I might as well get some writing accomplished! and 2) an idea for a story suddenly came out of the shower head one night (as always) and popped into my mind, conveniently in time for Camp NaNoWriMo. My goal is to reach 25,000 words, so hopefully I can get there by the end of the month! On the official Camp NaNoWriMo website my username is nutfreenerd, so be sure to message me if you’re also participating! I’d love to chat with other people about how their writing is coming along! 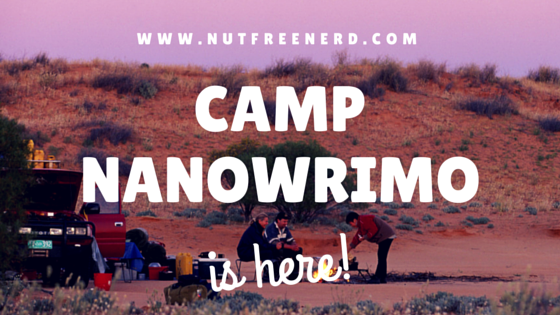 Are you participating in Camp NaNoWriMo this month? Have you done so in the past, or in any other of their events? Let me know in the comments section below! good luck with camp nanowrimo! i could never finish nanowrimo – just didn’t have it in me – but i believe in you! so good luck and yes somehow all my best ideas come while i’m in the shower as well… i need to take to having a waterproof pad or something so i can just jot down all my ideas haha. Thanks so much! 🙂 I completely agree with you- when I’m most desperate for ideas I’ve contemplated putting an dry-erase board in the shower so I could write some ideas down, but I’ve never actually done it haha. Hopefully someone invents an actual shower-writing thing soon!